Still Hoping: Campbell residents Jess and Georgette Sanchez, parents of missing Los Gatos resident Jeanine Sanchez Harms, were present at a Sept. 6 press conference in Los Gatos. The Carole Sund/Carrington Memorial Reward Foundation donated $5,000 for Harms' reward fund, for a total reward of $15,000. Jeanine Sanchez Harms' parents talk about their daughter with smiles on their faces. They have no problem describing her love of music or the way she rode her bike to her friend's house in their Campbell neighborhood. But when Jess and Georgette Sanchez, of Campbell, start to talk about family members and friends who have banded together to help find their daughter, their tears begin to flow. Harms has been missing since July 27. She was last seen leaving the Rock Bottom Brewery in Campbell with Maurice Nasmeh, 42, who told police he accompanied Harms to her Los Gatos residence and left at 1 a.m., after Harms fell asleep on her couch. Nasmeh's name was not released to the public until two weeks ago, when police say he stopped cooperating with their investigation. Los Gatos-Monte Sereno Police Sgt. Karry Harris said at a Sept. 6 press conference that Nasmeh still is not being considered a suspect in the case. Also seen with Harms that evening was William Wilson III, 42, who went on a date with Harms at 7 p.m. He told police he left Rock Bottom Brewery at 10 p.m., after Harms left with Nasmeh. Harris said Wilson is also is not a suspect. Since Harms' disappearance, a reward fund has been set up. Kim Petersen, a representative with the Carole Sund Memorial Fund, announced at the recent press conference that the fund donated $5,000 to the reward, making the total reward $15,000. 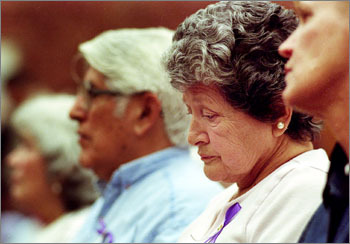 Sund and her daughter, Julie and their friend Silvina Pelosso were the victims of violent murders in Yosemite National Park. Petersen said the reward fund set up by the family at the time the three turned up missing was helpful in finding them later, even though they were not in the condition their families had hoped. "It is every family's worst nightmare," Petersen said. "We do believe somebody out there has information about this case." Later in the conference, Harris said there wasn't much new information to divulge, although police may be on the brink of uncovering new leads they have received since they released Nasmeh's name and posted his photo throughout Santa Clara County. "This case is still priority number one," Harris said, ensuring friends and family members that no one has been taken off the case. "We are still very hopeful that we are going to find Jeanine." Harris said that, contrary to what some of Harms' friends have said, Harms' disappearance is still being investigated as a missing person case, not a homicide. "We really don't have reason to believe that this is a homicide," Harris said. Police still do not want to reveal what items were removed from Harms' one-bedroom duplex, other than to say that it suggested foul play. As for Harms' well-being, Harris said, "We've tried to be very forthright with the family. There's a relatively high likelihood that she is not alive anymore." The Sanchez family has kept going strong and has seemed to emerge with renewed energy in their hope of finding Harms. "We're not going to give up total hope," Jess Sanchez said. "We still wake up and say 'Is this real?" Helping them through this rough period are dozens of friends and family members. "All of the relatives come over every day," Georgette Sanchez said. "I just can't believe how kind people have been. There are people we renewed friendships with--people we hadn't seen for over 30 years." Many of Harms' friends from Amdahl, the Sunnyvale company where she worked in purchasing, have volunteered their time as well. "It helped that she loved everyone at Amdahl," Georgette said. "She loved the environment, the employees." Since the disappearance, the Sanchezes have received many emails, letters and calls from people they never expected to hear from. "We don't get them as often as we used to, in the beginning," Georgette said. "Some of them were from complete strangers who expressed their empathy. People who have daughters." "Many letters that say, 'You don't know us and we don't know you...'" Jess said. The Sanchez's son, Craig, has headed up the organizational effort of volunteers and continues to manage everything from where he lives in Maryland. He was in town on a family vacation when Harms disappeared and stayed as long as he could to shield his parents from the media and the multitude of calls that started coming in. When he went back to Maryland, he became violently ill and had to be taken to the emergency room. His parents attribute his illness to stress. "When he left, we were terrified," Georgette said. "Craig has been the guiding force. I didn't want to go through that kind of a process. It's painful for us, and we didn't want to be asked the same questions over and over." The Sanchezes describe their daughter as a caring person who attracted people everywhere she went. "She was an extremely passionate person," Georgette said. Jess added, "In fact, I used to get a little angry with her because she contributed so much to animal causes." Harms was "totally devoted" to fitness and her mother said she thinks Harms looked 10 years younger than she was--42. Harms was also an avid member of her Methodist church in Campbell. She had been in the midst of divorce proceedings with Randy Harms, whom she married six years ago. "We're all on good terms with Randy," Georgette said. "He came to the house twice [since Harms disappeared]. He loved Jeanine. Somebody said he was taking it hard." Georgette said she had a dream about Jeanine not too long ago. "There's a phone call and it's Jeanine. I dreamed Jeanine called and said 'Mom.' Then I looked up to tell everyone she was on the phone and I woke up." Harms' friends have organized an awareness event planned for 6-8 p.m. Sept. 19 at Britannia Arms on Almaden Expressway in San Jose. For more information about the case, visit http://www.findjeanine.com/. To donate money to the Friends of Jeanine fund, either call Bank of the West at 408.354.6161 or send donations to The Jeanine Sanchez Harms Fund, c/o Bank of the West, 308 N. Santa Cruz Ave., Los Gatos, 95030. The Los Gatos Police Department can be reached at 408.354.8600. Anonymous tips can be left for the police as well. The number for that line is available on the website.